About two years ago, Lost in Translation reviewed the 2015 series, Thunderbirds Are Go, the CGI/miniatures remake of the classic Supermarionation series created by Gerry and Sylvia Anderson. That wasn’t the first attempt at adapting and updating the series. 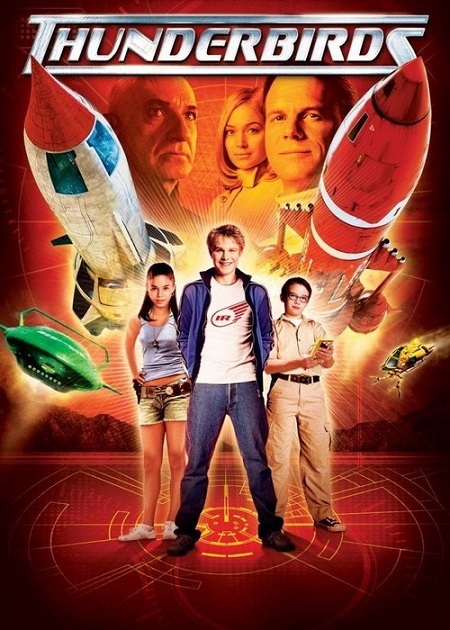 In 2004, a live action version hit movie screens. Today, Lost in Translation will review the film to see how well the series made the jump to the new format. The 2004 film, directed by Jonathan Frakes, begins with International Rescue responding to a fire on an oil rig. 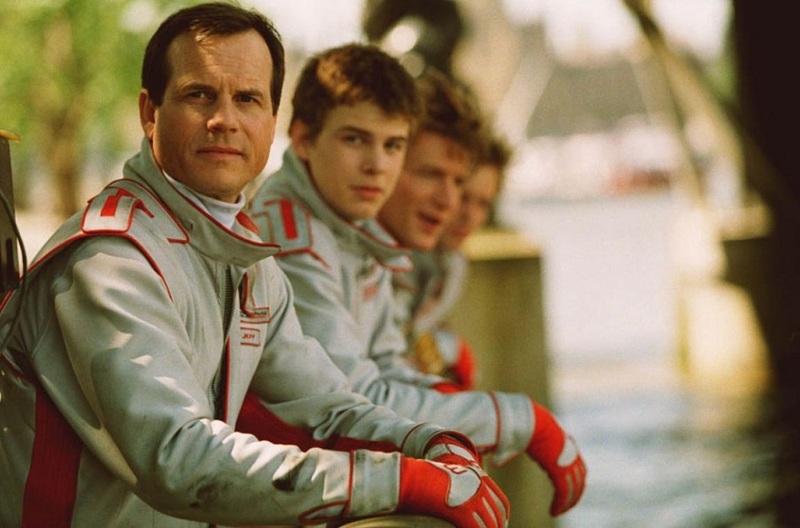 From Thunderbird 1, Jeff Tracy, played by Bill Paxton, directs his sons in rescuing the trapped workers. Scott Tracy maneuvers Thunderbird 2 as close as possible so that rescue lines can be shot down to the workers. Not all of the Tracy family is there; the youngest, Alan (Brady Corbet), is watching the report from Lise Lowe (Genie Francis) on TV at his boarding school with his friend, Fermat (Soren Fulton), the son of International Rescue’s mechanical genius, Brains (Anthony Edwards). Alan and Fermat mimic using the controls of Thunderbird 2, predicting what Scott needs to do. However, one of the workers is Mullion (Deobia Oparei), a mole working for the Hood (Ben Kingsley). Mullion fires a small rocket at Thunderbird 1, where it leaves a gooey substance. With his father busy, Alan’s ride back home comes in the form of Lady Penelope (Sophia Myles) and her chauffeur, Parker (Ron Cook). She brings Alan and Fermat back to the island in FAB-1. 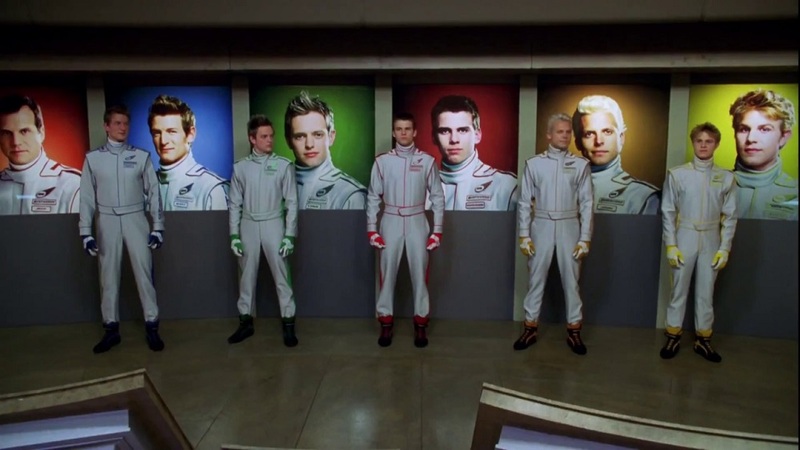 During the reunion, Alan expresses his desire to be a Thunderbird and follow in his family’s footsteps despite his age. The discussion ends with neither Alan nor his father satisfied with the outcome. During this, Lady Penelope gets a call; the fire on the rig wasn’t an accident. Still upset with not being allowed to join his brothers on International Rescue, Alan takes Fermat down to Thunderbird 1. They go through the motions of the initial launch, but Alan accidentally starts the vehicle’s engines. He shuts them down, but not fast enough. Jeff calls him up. Leaving Thunderbird 1, Fermat notices the goo, a gallium compound that is electro-reactive. Alan tries to tell his father but gets grounded. On a submarine, the Hood uses the gallium compound to find the island. His plan, take over International Rescue’s headquarters. To do that, he needs the Tracys to leave and the best way to do that is to have them rescue someone. The Hood has his other minion, Transom (Rose Keegan), launch a missile at Thunderbird 5 in orbit. John Tracy (Lex Shrapnel) is injured in the impact and gets out a mayday. Jeff, Scott, Virgil (Dominic Colenso), and Gordon (Ben Torgersen) leave on Thunderbird 3. Once Thunderbird 3 has launched, the Hood invades. 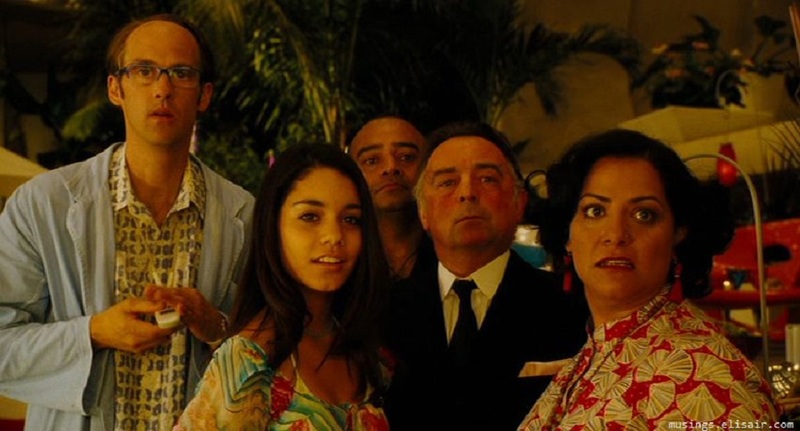 Alan, Fermat, and Tintin (Vanessa Hudgens, credited as Vanessa Anne Hudgens) notice the Hood’s sub arriving. They try to get to the house first, but the Hood is faster. Inside, the Hood uses psychic mind control to force Brains to turn over command and control to him, then cuts off the Tracys in orbit, shutting down Thunderbirds 3 and 5. Alan and his friends, though, have snuck inside using the vents and discover the Hood’s plans; to use Thunderbird 2 to rob a number of banks, pinning the crimes on International Rescue. Fermat’s allergies, though, give the kids’ position away. Alan figures the best way to escape is to use one of the remaining Thunderbirds. The Hood also realizes that and sends Mullion with a number of mooks to retrieve the kids. Alan’s knowledge of IR’s equipment lets the kids escape, only to be trapped by the Hood himself. He does manage to escape, discovering the Hood’s weakness, but falling through one of the vents used by Thunderbird 1 to bleed off the exhaust from the engines. Transom fires up the vehicle’s engines. Afterwards, she checks the monitors and does not find Alan, Tintin, or Fermat. It’s close, but the three kids did survive, landing in the water just as the flames engulfed them. Alan works out that the best way to get help is to contact his father; they just have to get to the transmitter. Fermat reveals that he has Thunderbird 2’s guidance component, which prevents the Hood from leaving. In London, Lady Penelope realizes that several disasters haven’t been responded to by the Thunderbirds. Since the only way for IR to not respond is that they’re in trouble, Lady Penelope has Parker take her to Tracy Island, after breaking several prior commitments. At the transmitter on Tracy Island, Fermat gets a message to the Tracys in orbit and starts trying to restore control to them. Transom, though, tracks the signal and jams it before Thunderbird 5 The Hood sends Mullion out to retrieve the kids. Alan knows he’s coming and goes to the junkyard where he rebuilds a hoversled. He gets the vehicle ready just in time, getting it going just as Mullion arrives. The chase ends when Alan pushes the hoversled too far, losing Tintin and Fermat, who are captured by Mullion. FAB-1 arrives at the island. Lady Penelope and Parker march into the house and confront the Hood. He has Mullion and Transom try to capture the pair, but Parker’s sordid background lets him stand toe-to-toe with the Hood’s heavy with the occasional assist from Lady Penelope. The Hood, though, uses his psychic abilities to stop the pair. When Alan arrives, the Hood demands the guidance component back. Not wanting Lady Penelope or Parker to suffer, he hands over the component. The three heroes are taken to the freezer where the rest of the captives are being held. With the guidance component returned, the Hood and his minions launch in Thunderbird 2 to go rob the Bank of London. In the freezer, Lady Penelope and Parker untie themselves then the rest of the captives. Parker unlocks the door, letting everyone out. Fermat restores control to Thunderbirds 3 and 5 just in time. With Thunderbird 3 too far to reach London in time, it’s up to Alan, Fermat, Tintin, and Lady Penelope to stop the Hood using Thunderbird 1. In London, the Hood uses a tunnelling vehicle to get from Thunderbird 2 to the Bank of London’s vault. He takes the direct route, which damages supports for the monorail. When Thunderbird 1 arrives, one of the monorail cars falls into the Thames. Alan, realizing that the only people who can help are he, Tintin, and Fermat, runs to Thunderbird 2 to begin the rescue. Working as a team, the three kids get the monorail car back to the surface as the rest of Alan’s family watches. Lady Penelope leads the charge into the Bank of London to stop the Hood. She and Jeff are taken prisoner by the Hood. However, Alan knows the Hood’s weakness – the villain gets tired after using his psychic abilities. He forces the Hood to overextend himself and, with Tintin’s help, defeats the villain. Thunderbirds was aimed at kids. The protagonists are young, the film was rated PG, and there’s a level of humour that comes through even during intense sequences. However, the original Supermarionation series was also aimed at kids. The villains are frightening but not overwhelmingly so. The fight between Mullion and Parker is light-hearted. The main themes are of friendship, family, and responsibility. The movie is a family-friendly action flick. As an adaptation, there was an effort to stay to the feel of the TV series. While getting actors who look like marionettes is difficult, the casting managed to pull it off. Of note, Lady Penelope, Parker, Brains, and the Hood are close to perfect casting. Ben Kingsley not only looked like the Hood did in the original, he made sure the character came off as competent. The villain didn’t luck out, nor did the villain make a simple mistake; the heroes had to work for their victory. Ron Cook as Parker was also note perfect, with the right accent and attitude. Even the Tracy boys had hairstyles that their characters had as marionettes. The draw of Thunderbirds is the vehicles. Again, there was an effort to make sure that the Thunderbirds looked like they did in the TV series while still updating the looks to reflect modern sensibilities. Thunderbirds 1 and 2 were sleeker but still recognizable. Only Thunderbird 4, the sub carried by Thunderbird 2, had a major change. The sub also had the least screen time, with most of that time spent showing the interior as Alan piloted it. FAB-1 also changed, more out of necessity. The studio couldn’t get permission to use the Rolls Royce marque without using an actual production model, none of which have six wheels. Ford stepped in, providing a modified Thunderbird for Lady Penelope that harkened to FAB-1 in the TV series. The story itself would fit with the original TV series. International Rescue remained a rescue service, not a crime fighting unit. Lady Penelope handled the investigation side of the plot, as she did in the series. While the focus was on Alan, Tintin, and Fermat, the latter being a new character, the Tracy family still were in character. The only real issue, if it can be called one, was the focus on Alan. The nature of the film and its target audience required a younger protagonist. Yet, Alan was still a Tracy. Overall, while there were elements that diverged from the TV series, Thunderbirds worked to be a successor, keeping with the look and feel of the original. The effort pays off; the movie is very much a Thunderbirds story, even if there isn’t any Supermarionation involved.